My dad is a great home cook and an author -- usually of Public Health textbooks, but now of our upcoming cookbook! He and I have been working together to prepare (him) and photograph (me) a book's worth of recipes, ranging from family classics to Julia Child standards. Our goal is to have the cookbook out by Christmas, but below is a sneak peek of one of my favorites. This is from Julia Child and More Company, with few modifications. It is probably the no. 1 dinner party appetizer in our household. It can be made earlier in the day, except for a final whisk before dressing the shellfish and scooping it in the artichokes. Cut all but ¾-inch off each stalk and with a paring knife, peel off the outer layer of the remaining part of the stalk. Remove the tough, small, outer leaves at the bottom. Julia prepares the uncooked artichokes in an attractive way, cutting off the top ½ inch or so (very carefully so it is straight) with a large kitchen knife, and cutting off the sharp ends of the leaves in a concentric pattern with scissors – but hardly necessary. After each artichoke is prepared, smear on some lemon juice so it doesn’t discolor. Boil or steam artichokes however you like. I prefer to steam them on specifically designed article steamer racks in an inch or so of water. I add the minced shallot or scallion and a little white vinegar to the water. Check the pot periodically to make sure the water doesn’t boil out. How long it takes to steam or boil depends on the size of the artichokes; steaming generally takes 30-50 minutes (50 if they are enormous). To steam all three at a time you need a very wide big spaghetti pot. When artichokes are done (pull off and bite into a leave to see, making sure to remove from the heat so you don’t steam yourself), set aside to cool. Carefully slice in half lengthwise to have 6 equal-sized pieces. Scoop out the inedible choke (a paring knife helps), and a few of the inner leaves so you have a nice-sized pouch for the seafood filling. Refrigerate until ready to use. Shell and devein the shrimp and sauté them in some olive oil for a minute or two on each side until barely done. Remove, drain on paper towels, chop each shrimp into 3 or so pieces, and put into medium-size bowl. Halve the scallops if large. Add a little more oil to the pan and sauté for a couple of minutes, turning, until barely done. Drain, and cut up a little so they are about the same size of the shrimp. Add them to the shrimp, and toss with a little salt, pepper, and lemon juice. Cover and refrigerate. Put each half artichoke, cavity side up, on a salad plate. Whisk the dressing one more time and mix into the shellfish. You may or may not want to use all the dressing. 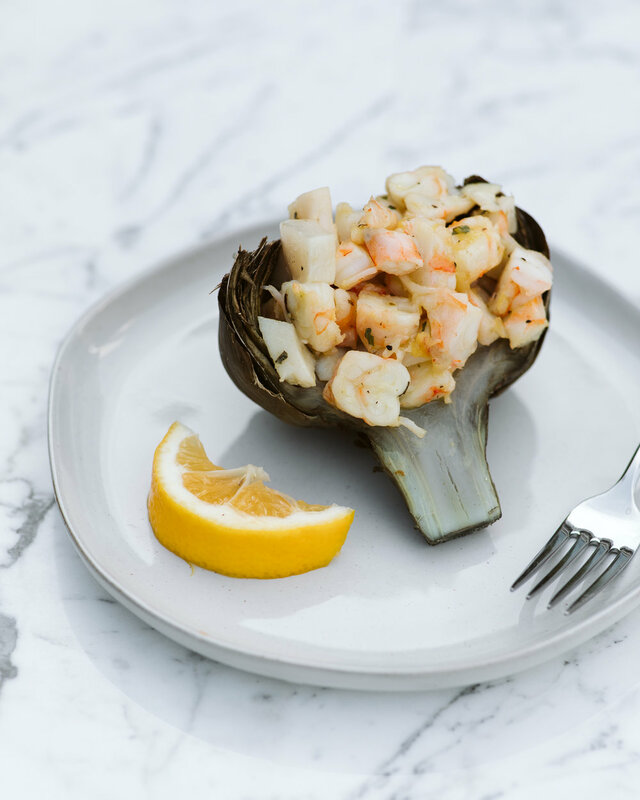 Scoop the shellfish into each artichoke and serve soon. Guests generally eat the filling first, and then go at the leaves and heart. To Dip or Not to Dip – and into What? There are four ways to go here. (1) Eat the leaves without any dipping sauce, or provide little bowls with: (2) store-bought mayo, which to me is pretty delicious; (3) extra dressing from above recipe (if so, make maybe twice as much as the recipe calls for); or (4) make your own mayo. I am partial to the last method and it couldn’t be easier with a food processer. It can be made in advance and keeps in the fridge for at least a week. Find a recipe on the Internet is simple. The main thing I want to recommend is that you NOT use virgin olive oil. For chemical reasons I don’t understand, it comes out very bitter. You can use “pure” olive oil instead, but I recommend instead that you use a neutral oil like grape seed. Typically the only other ingredients are (fantastic) olive oil, egg yolk, lemon juice, and salt.